Fences - split rail, chain link, wood - in Lake Arrowhead, Big Bear, Crestline, Running Springs"
A fence affords privacy and beautify, and keeps unwanted animals out while adding value to your property, as well as giving Fido a place to roam! 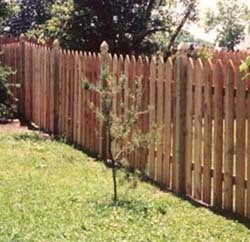 Whatever your fencing needs may be, rest assured that VB Landscaping has the solution. We build fences of all types - chain link, wood, split rail, etc.